A recent survey of Registered Massage Therapists in Ontario indicated that research awareness is one of the top priorities for the massage profession (Baskwill & Dore. 2016). Since the use of research evidence in clinical decision-making is a core skill for health care practice. It is important that students learn to think critically and evaluate research as part of their entry to practice program. In an effort to provide students with the tools to bridge the gap between research and clinical practice. This is a compliation of resources to set the groundwork for evidence-based practice. A great way that massage therapists can enhance their knowledge is by establishing a Personal Learning Network. In this form of online collaborative learning social media sites like Facebook, Twitter and YouTube provide a digital meeting ground. Here massage therapists can access timely information, learn to think critically and develop research literacy skills. Evidence based practice is a process intended to optimize decision-making by emphasizing the use of evidence from well designed research. This includes the use of logical reasoning and the gathering of ideas and knowledge from many overlapping disciplines. 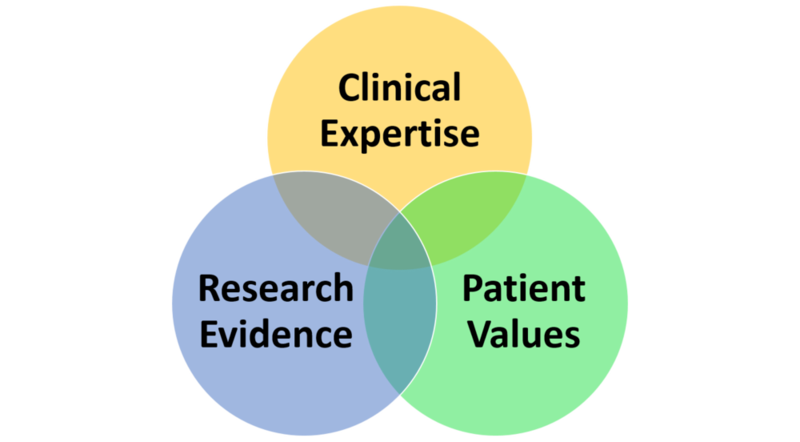 Evidence-based practice systematically integrates research evidence with clinical expertise and patient values to achieve the best possible patient management, while minimizing the potential for harm. • Clinical Expertise - This is used to create unique evidence based outcomes and results with patients on a case by case basis. Making sound decisions requires the clinician to expertly assess the patient’s personal, social, and clinical context and integrate this information with the values and preferences of the informed patient. • Patient Values - A number of biopsychosocial factors may influence your decision making based on patient unique goals and needs. Therapists needs to be able to hear the patient’s values, create a working relationship with the patient, involve the patient in developing the plan of care and use his/her clinical expertise and allow the evidence to guide this process, rather than dictate it. • Research Evidence - Research's main role is to help guide clinical decisions and to warn of known harm, the higher the quality of the evidence the more confident we can be as a therapist making an informed decision. In this age of ‘new media’ and 'fake news' it is important to be able to critically evaluate information. If you are unsure of the validity of what you are reading The CAARP Method is a simple acronym will simplify the way you evaluate information. As a starting point here is a Guide to Reading Massage Therapy Research that will introduce learners to a number of research concepts. Evaluating research involves ranking studies based on their methods. The Hierarchy of Evidence Pyramid provides an overview of various types and levels of scientific research. Systematic reviews sit at the top of the pyramid, followed by randomized control trials and observational studies. Expert opinion and anecdotal experience are ranked at the bottom. With the ‘CAARP’ method in mind, if you would like to read articles on a more broad range of topics, you can use a research database. PubMed is the largest medical database, and has many functions that will help you narrow down your search. Here is a List of Research Journals for Massage Therapists, as well as common PubMed searches for massage therapists. One limitation with PubMed is that, some of these article are behind a paywall which may limit access to the entire article. You will still be able to read the abstract, this will give a brief summary of the key points of the article. One limitation with PubMed is that, some of these article are behind a paywall which may limit access to the entire article. You will still be able to read the abstract, this will give a brief summary of the key points of the article. There are alternatives- In recent years there has been a growth in open educational resources in a number of disciplines. As part of this initiative, I have complied a list of Open Educational Resources for Massage Therapy Students. Many of the methods used in manual therapy have simply not been studied in large scale research programs, this is because clinical trials are expensive. The fact that there is little to no research is not always evidence that a method is useless, only that no research has yet been carried out to show its value. One step massage therapists can take to move the profession forward is by using case reports to document what they do on a daily basis in the treatment room. This article provides links and resources to Help Massage Therapists Publish Their Own Case Report. Baskwill, A.J., Dore, K. (2016). Exploring the awareness of research among registered massage therapists in Ontario. J Complement Integr Med. Patelarou, A.E., Kyriakoulis, K.G., ... Patelarou, E. (2017). Approaches to teach evidence-based practice among health professionals: an overview of the existing evidence. Adv Med Educ Pract.